This is an original glass slide that was sent to a movie theater in Green Bay, WI between 1916 & 1918 to show between films giving current news and events. 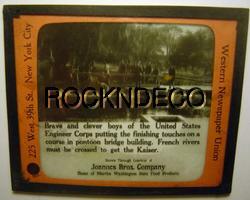 This glass slide's caption is "Brave and clever boys of the United States Engineer Corps putting the finishing touches on a course in pontoon bridge building. French rivers must be crossed to get the Kaiser." "Shown through courtesy of Joannes Bros. Company - Home of Martha Washington Pure Food Products". This glass slide was produced by the Western Newspaper Union of New York City. The slide measures 3-1/4" x 4". The glass slide is in good condition - there is light dirt on the bottom half of the slide and a few small marks - . A NICE PIECE OF WORLD WAR I / NEWS MEMORABILIA! Postage is $3.50. Each additional slide would be one more $1 to ship. Buy four of these glass slides and I'll thrown in the original box they were shipped in to the theatre.